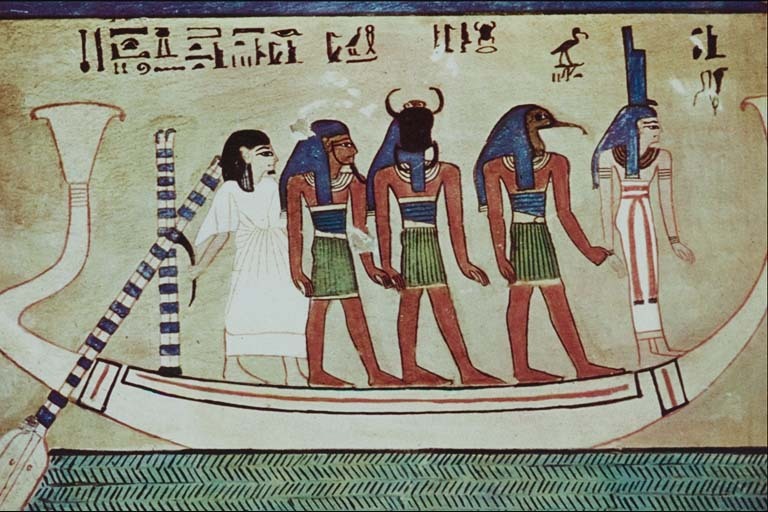 About the Rite: In addition to the Book of Coming Forth by Day, the Coffin Texts, and the Pyramid Texts, there were other ancient Egyptian texts that served as guides to the Otherworld. Two of the most important are known as the Amduat (“What is in the Duat”), and the Book of Gates, both of which date to the New Kingdom. Rather than being a collection of often-mix-and-match sacred texts like the previously mentioned books, these books have a very specific order. They follow the Sun God (and the dead king who accompanies Him) as He passes through the Twelve Hours of the Night—from sunset to sunrise. As you might imagine, the journey also has to do with death, regeneration, and rebirth. As the Sun God’s ba or soul passes through the Night, He illumines and gives life to the inhabitants of the Otherworld; at the same time, He Himself is regenerated. At the deepest part of the night—the Sixth Hour—Re’s ba rejoins His corpse (as Osiris) and is immersed in the fluidic Nun, the primordial waters from which Creation emerged In The Beginning. By connecting with this original and eternal energy, the Sun God is renewed and thus may be reborn at dawn in full power. I’ll be the dead guy. Or more precisely, I’ll be the dead Prophetess. The last time I undertook a ritual this big, a lot of things in my life changed and I’m not entirely sure they’re finished even yet. Those changes were and are tough ones, not gentle. Of course, the God involved was Dionysos. If you know Him, enough said. This rite is intended to renew the Prophetess or Prophet of Isis after years of spiritual work; after you get a little crispy around the edges. And I am a bit crispy. So I have been working to open myself fully to the magic of the ritual, to the ultimate Egyptian magic of renewal. It could reasonably be argued that renewal is what the ancient Egyptian magician-priestesses and priests did best. I hope that we will tap into that ancient current tonight. I pray that Isis will be with me. When describing the Egyptian Duat, the Underworld, people often say things like “it was a dark and terrifying place.” Well, it could be. But it wasn’t always. In some parts, there are beautiful fields and rivers. The Duat is, in fact, the source of richness on earth. For those whose heart was not true, indeed terrors awaited. But for those who walk in truth, the scary things are merely tests to be passed so that one may come to rebirth pure and new. beside you with Heru holding your hand. i love the little smiley face at the bottom of the website!!! i just saw it and it made me laugh just seeing a random little smiley face. you just made my day! !